While Niagara Falls are a worthwhile sight any time of year, they really shine after dark when colorful lights illuminate the roaring waters. And in summer, fireworks add to the magic. Here's everything you need to know about these special events. The Niagara Falls illuminations takes place nightly at dusk, and timing your visit accordingly will allow you to look out over the multi-colored falls for a unique view. The summer fireworks shows run from May to September. In May, you can view the displays on Friday and Saturday nights at 10pm, but beginning in June, the fireworks take place every weeknight at 10pm for six minutes (with especially brilliant shows on Canadian national holidays). For an illuminated view, visit the falls after dark and watch the special waterfall night show either from a cruise on the water or from a restaurant with a full view of Niagara Falls. Some tours also offer access to the Illumination Tower, where you can choose (and change!) the color of the bulbs that light up the cascading water. And in summer, you can see the fireworks and make the most of your time in the area by choosing a guided tour that gives you access to the tunnels behind the falls, allows you to see the waterfall both during the day and after dark, or gets you up close by boat. Boat tours get you as close to the falls as possible. 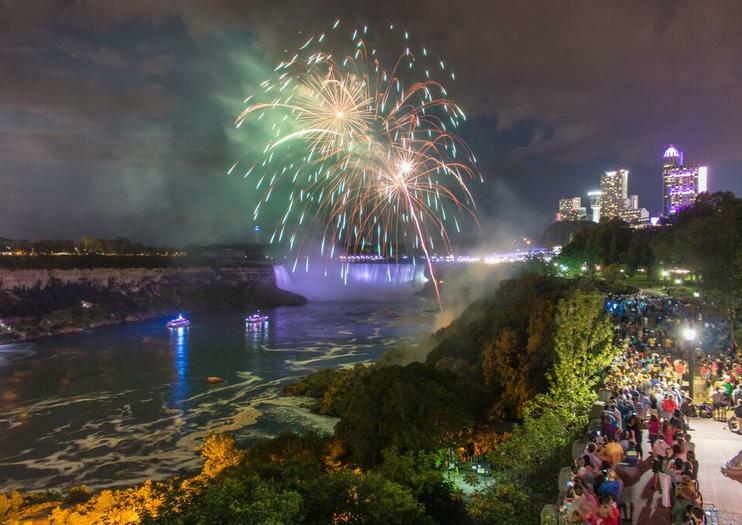 The Niagara Falls fireworks show makes for a unique event that can only be experienced during summertime. A combo cruise and dinner tour is an excellent way to get the full Niagara Falls experience from both land and water. Some tours offer round-trip hotel transport from the Canadian or American side of the falls. Appreciate the full grandeur of the Niagara Falls area by day and night on this 9.5-hour guided tour from Toronto. Aboard a first-class minibus accommodating a small group, travel along the scenic Niagara Parkway and stop at the Floral Clock, Whirlpool Spanish Aero Car, Niagara-on-the-Lake, a local winery and more. A Hornblower Boat cruise gets you delightfully close to Horseshoe Falls. After sunset, be dazzled by a light show illuminating Niagara Falls. Upgrade to enjoy a buffet dinner with prime views of the falls. Round-trip hotel transport included.